Ocean-themed dish garden with succulents. "I'm going to try to make a Little Mermaid themed moss/fern terrarium for a friend of mine and I saw one that you made which had a fern that I thought might give a good impression of a bed of kelp....I was wondering what your impression of that sort of idea might be. Do you think that type of fern might get too bushy and full, does it start to grow horizontal rather than vertical, because I like the look of just a few fronds sticking straight up. Also, if you might be able to tell me what that fern is called so I might go about trying to get some." I think a mermaid-themed terrarium would be great fun to put together. I included a photo of a succulent dish garden at the top of this post as a starting point. If you'd like to make an easy-care gift for your friend and ensure it will stay nice and healthy for a while I would suggest doing a dish garden with succulents! Succulents look a lot like sea anemones and they absolutely thrive in an open-top dish garden with some sandy soil. I know what you're thinking now- "Lauren- I wanted a terrarium- duh." Absolutely. An ocean-themed terrarium would be great fun as well! Of all the plants I use in my small terrariums I think your best bet will be selaginella or Spike Moss. It thrives in terrariums but is not invasive, it is hardy and beautiful- and looks a little like coral! You can find Spike Moss at places like Home Depot fairly often- just look for it in the small containers in the houseplant section of the nursery. If you would like more vertical growth to emulate kelp I would suggest visiting your local aquarium store or aquarium section of a pet store. They have lots of plants that look like kelp for around $4. If you don't mind the fern-look my standby for vertical growth is Boston fern ( I think?). I recommend digging up a baby frond with a bulb at the end to plant in your terrarium. These ferns grow predominantly in Santa Barbara and I can normally find some bulbs when I need them. Don't forget some beach glass or small sea shells for decorative elements. Some beach rocks with holes would be fun too! Get creative but remember to rinse your container and deco items with a bleach-water combo and to let them fully dry before you begin and to quarantine your plants in a plastic bag for a week or so. Taking these two steps will ensure your terrarium won't be full of mold when you give it to your friend! 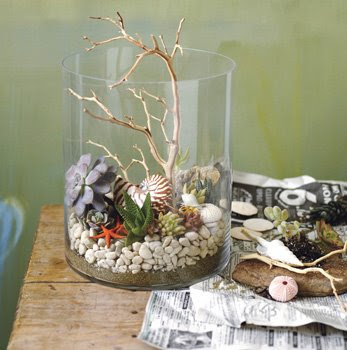 What a great idea, I like the terrarium in the photo sure looks great. I agree with Cathy, what a good idea. i love your blog!! so great and specific!